Well we finally did it, by drawing lots and lots of attention to the “Kelt” from the Invergordon Distillers, we actually encountered someone who not only had a bottle of Kelt but was more than willing to open it and have a wee tasting. Step forward Alistair Dalgliesh a local and well known entrepreneur and his lovely wife Jaqui who runs a successful virtual assistant website. This little and precious bottle has been coveted for almost 10 years, I suppose after my little bottle has languished in the bar for that length of time it may be time then for another Whisky Tasting. On Saturday the 17th January 2009 we all gathered at Dougies humble abode, around the table we sat nosing / tasting glasses to the ready. Jim as usual was first to hold his glass out followed very closely by Dougie Bell (a previous guest taster) Alistair himself and his good buddy Sandy Blair, an old acquaintance of mine who introduced Alistair to me on Hogmanay and who I in turn introduced to the Whisky Boys website. It was after perusing this site that Alistair and Jaqui decided to go for the opening of their little bottle, and where better to taste it than with the Whisky Boys and friends. We found it a little too difficult to pin down any individual nuances and after a lot of hot air and Whisky fumes blowing all over the place, we decided in this special case to have joint tasting notes, rather than our usual individual opinions. Nose…Antiseptic hospital wards with a sweet brandy background. Taste…Very smooth and complex with no individual characteristic coming to the fore. We all agreed that this wee dram would make an ideal after dinner substitute to your usual liqueur due to its natural viscosity and sweetness. It is hard for me to say go out there and buy one, it ain’t that easy but if you search around you can get one, Jim the other week was able to purchase a bottle with packaging in very fine condition on E-bay for the princely some of £9.99 plus postage, the Whisky Boys now have two bottles of this little gem. 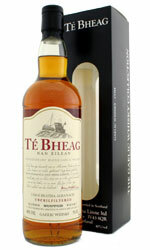 Now the night did not end there, Jim had brought along a bottle of Te Bheag. 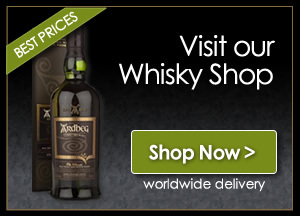 Te Bheag has two meanings the first being ” The Little Lady” which is the name of the boat on the companies logo, and it also means in colloquial Gaelic a “wee dram”. This blend has a high content of five and 11 year old malts mainly from west coast distilleries and the use of sherry casks for storing. Once again we opted for the joint tasting notes and as was the Kelt this one also was a hard one to pin down. Nose…Slightly antiseptic with a touch of burnt wood. 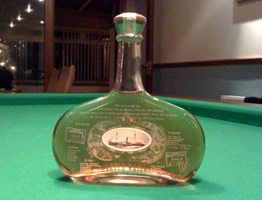 Taste…Full bodied with a slight Islay influence showing through although benefits from a good splash of h2o. Finish…Medium length, dry, with a faint liquorishness. How good was it, well we tasted and tasted and all of a sudden the bottle was empty, yes a very nice and palatable wee dram. This is not an easy bottle to come buy I have not seen it up for sale in my usual places, but on this occasion the Co-op in Carronshore Falkirk is where it can be found.